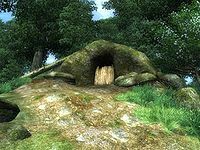 Muck Valley Cavern is a small cave between the Imperial City and Cheydinhal containing animals (quest-related). It contains only one zone, Muck Valley Cavern. This cave contains 19 Cairn Bolete plants. Regardless of whether the associated quest has been received, the player will encounter Sibylla Draconis. She will attack, but killing her does not prevent completion of the Next of Kin quest. Muck Valley Cavern also appears in ESO. 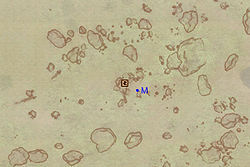 This location's map marker (M on map) is named Muck Valley Cavern (editor name MuckValleyCavernMapMarker). The entrance door is WNW of the marker, 20 feet away. Muck Valley Cavern is the home of Sibylla Draconis who abandoned both her mother and the empire and now lives as a savage with her beloved animals. 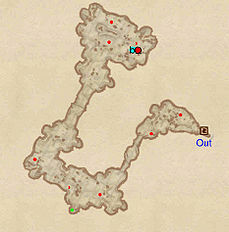 During the related quest she is your target, and rightfully so, as the cave is one large room and contains absolutely nothing but a single healing chest (green dot on map). 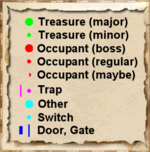 She initially starts at Q, near her bedroll at (b), but will move around the entire cave, right down to the cave entrance at Out. After the kill, empty the lonely chest, then leave Muck Valley Cavern the same way you came. This page was last modified on 3 June 2017, at 18:37.